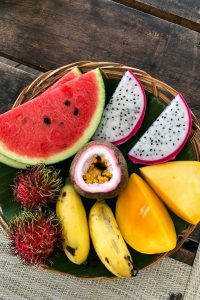 Eating and travel are lots of fun. Hopefully when you hit the air – and the road – with friends, there will be a lot of hits. But inevitably, you do run the risk of a few misses. En route to a remote part of Sweden, we drove for a while, seeing nothing but trees, remarkably blue skies, one or two clouds, and a car-free road in front of us. But soon our tummies started rumbling. We had hoped to pass a charming little place on one of the picturesque little lakes that we kept driving by, dreaming of platters of fresh fish caught that morning with a bowl piled with new potatoes, slick with Swedish butter, dill sprigs, and crunchy flakes of salt. Alongside we might sip a locally made beer. Then finish up with a bracing cup of good Swedish coffee to send us back on our way. The good news is that they were still serving and there was a sunny deck to sit on with – yes – a real Swedish lake off in the distance. “What’s that?” one of my friends asked the stout, rosy counterwoman. 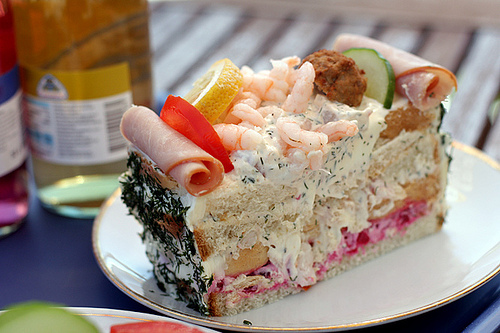 “It’s called a Sandwich Cake (Smörgåstårta). '” Intrigued (well, she was more than the rest of us…) she ordered one and I opted for the less-complicated, what-you-see-is what-you-get meatball sandwich smeared with equally rosy beet mayo. For some reason, the third in our party thought that he and I should share one of the sandwich cakes as well. (And when I say, “for some reason”, it’s because after trying a forkful of the sandwich, I’ve decided not to speak him any more.) A lot of the beauty of Scandinavia comes from austerity, and I tend to agree with the less-is-more mentality, and perhaps let the pictures speak for themselves. I was only able to make it through a few bites of my sandwich cake. I mean, I like the idea, but am not sure this was the “Best of” Swedish cuisine that I was looking for. Once we got through lunch, as best we could (does anyone really finish that? ), we hopped in the car and sped off to our next adventure. Oh, looks interesting… And it reminds me of “torta salgada” (savory pie) of Brazil. We make torta salgada with sliced bread, mashed potatoes and chicken. BTW, what is that dark green stuff on the sides of the smörgåstårta? Oh, when Smörgåstårta is actually good – like from a great cafe or bakery – it’s really good. Dilly and lemony and shrimpy and fresh and very very mayonnaise-y, with a bread that is made especially for the cake. I haven’t been back to Sweden in many years but I still crave the one we got from a bakery for a holiday lunch, and from my favorite little cafe in Gothenburg. IKEA in the US does a pale approximation, apparently better than the one you had though. Wow…Is this Sweden’s answer to bread and butter pudding? Looks like the equivalent of the good ol’ American Sandwich Loaf. A concept I can never, ever get my head around. Colorful meal though! What on earth is “IN” the sandwich cake? It’s pretty. But it seems to be a lot of bread and maybe cream cheese? What is that herb on the sides? Your meatball sandwich doesn’t look too good either, except for the beet spread. Love beets! Hopefully, you’ve found a more appetizing place to have dinner. I’ve had wonderful sandwich cakes, but also ones to be less than thrilled about. In all though, i avoid them. They were the thing to serve at whatever party in the 1970 -80s, recently they’ve had something of a comeback where there’s been some more or less ambitious projects to rehabilitate their general standing as food. I was recently in california and was asked to make something “swedish” for a potluck. 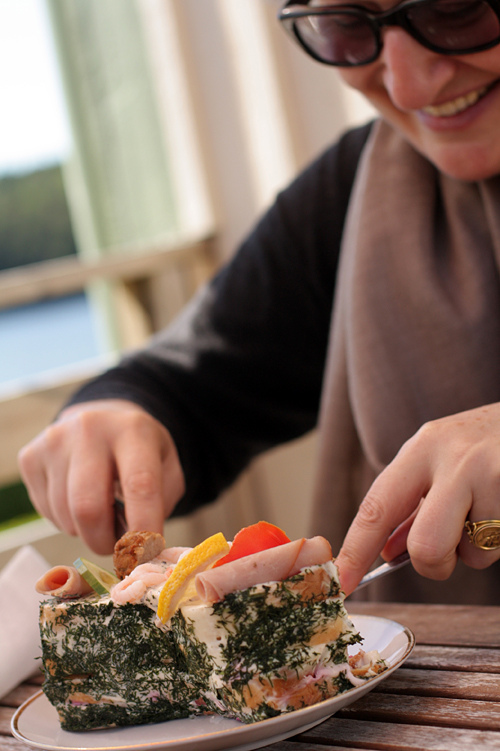 Several swedes suggestef a sandwich cake. I ended up making janssons frestelse, a porati gratin with onions and anchovies plus cinnamon bund. People seemed to like that too. Driving to fäviken takes you across some rural areas for sure where things are far apart. I’ve never been to fäviken and most likely never will. You’ve must have had over 20 hrs of daylight upon your arrival though. Haha, I’m relieved I’m not the only one who thinks that Smorgastrata actually looks pretty tasty! Must be the Scandanavian blood in me. That would go down great at some picnics in the Midwest. Gone in seconds! This was pretty common at wedding and baby showers here in Minnesota; the filling is usually tuna salad and egg salad layered between the slices of bread. The “frosting” is just softened cream cheese then all refrigerated. It’s actually something I enjoy. My mom used to make a very pink canned beet, pea, and American Cheese cubes salad which your pink mayo reminds me of; I did not enjoy it. We called it Pink Salad. It was very wrong. Just watch out if you get invited to an early surstromming party. Joao and Claire: It’s fresh dill. 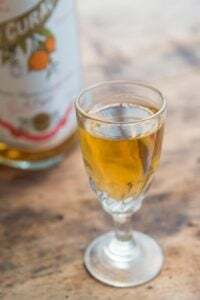 Lyn: I would imagine it could be quite good – depending on the ingredients used. And served in reasonable-sized portions! Alec: Considering I took the rap for not finishing it, I expect not just 2 jugs of Swedish syrup, but a sandwich cake made from leftover baguettes Brie de Meaux, confiture de lait, and cornichons. It looks like the cook or chef liked bright colors, especially pink! Katie: (sorry David for hogging the comment-field!). The pink colour is natural, it comes from the beet-roots that are in the salad. ^_^ there are as many different ways of making a Smörgåstårta as there is kitchens. And the cake can differ alot between the “states” . And FYI beet-mayo in a Smörgåstårta?! Sacriliege! Eh, thats shortcut to make sandwich cake/voileipäkakku when you use readymade beet salads or others.. and i have no conception of why there is seafood and meat mixed. 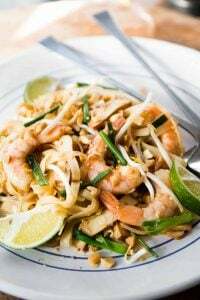 Its usually meat and some cold cuts, or chicken same way or if its fish then it can be mixed with seafood or be just seafood. But rarely any commercial places are doing it right, its really labor intensive when done right, but then you get awesome taste. But when its bad its really bad..
That sandwich the most confusing photo I have ever seen…even though I have seen sandwich cakes before it still did my head in!! Maria, Never having seen one of these Smörgåstårta or sandwich cake/voileipäkakku before, what is the Finnish way? Would you be willing to share your recipe? I just heard of Smörgåstårta for the first time this past week, having seen one on a French/Swedish lady’s blog I read and it looked stunning – absolutely wonderful. I think that, as for any multi layered sandwich, a lot depends on the layers between the bread; they have to be compatible in taste and colour. Layers of egg salad and thinly sliced smokes salmon and maybe another of herbed cream cheese for example. Definitely do not mix meat and seafood on the same torta, and go easy on the mayonnaise. No one flavour should be overpowering, though complementary tastes (e.g. dill and lemon/sour) can prevail. 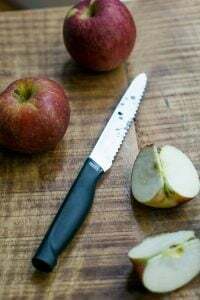 It should also be easy to cut and still look good to eat when sliced. The real attraction is how the torta is decorated on top. Her’s was piled thickly, but very decoratively with fresh herbs, sliced lemons, leaves, asparagus, plump pink shrimp, sliced baby tomatoes, capers arranged in patterns, with the ubiquitious cream cheese and dill on the sides. It looked like a miniature garden and was a mouth-watering work of art. I can’t say I’m dying to try the meatball and beetmayo sandwich, though. Katherine, it seem my long answer is hanging on moderation due to links i put on it, i think, so its there but i dont know when it will be shown. But, i dont want to say that swedish dont make nice sandwich cakes, i have had pleasure to eat some very nice ones at my travels there but my swedish speaking is very limited so im little lacking of putting swedish links on this. Well, I guess appearances are deceptive! The sandwich looks anything but bad. I, too, think this Smorgastarta looks fab! This salty cake is similar to a sandwich, but it has such a large amount of filling that it more resembles a layered cream cake with garnished top. 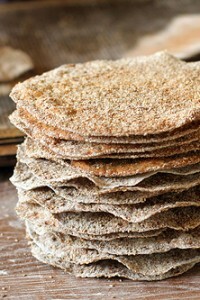 The smörgåstårta is normally made up of several layers of white or light rye bread with creamy fillings in between. The fillings & toppings vary, but egg & mayonnaise are often the base, additional filling may vary greatly but often includes one or more of the following: liver paté, olives, shrimp, ham, various cold cuts, caviar, tomato, cucumber, grapes, lemon slices, cheese & smoked salmon. For the best result, assemble the cake the day before consumption & let it rest in the refrigerator overnight. Decorate the cake on the day of consumption. Serve cold & sliced like a dessert cake. I’ve had a sandwich cake bookmarked in my Pinterest links for ages and never got around to making it, but you’ve reminded me just how impressive they look. So appealing on the plate! OMG! My favourite part is the little rolls of ham at either end. It makes the whole thing look like a tiny sofa for the prawns to repose upon. SO ENVIOUS that you are in Sweden for midsummer! I know you will find remarkable, fresh food, as well. And the long hours of sun–not to be missed! Kinda looks like a souped up version of an American Club sandwich. I love the idea of beets, mayo and meatballs. We, that is, 20 Swedish women had a picnic in Central Park a few weeks ago. The fare was Smörgåstårta from a local place. It was awful! There is an art to making this dish. The breads have to be dense pullman type loaves, the fillings flavorful not too soggy etc.etc. Meats and seafood should not be mixed together. Interesting that such a retro dish is still available, and that many have fond memories of it, which is why it had been ordered for our picnic. Am looking forward to your next posts from Sweden. Hope you are there next weekend to celebrate Midsommar the most Swedish of holidays. Hysterical post !! Just as entertaining though not nearly as appetizing as your usual work :) Good luck finding something to eat and I look forward to more posts from Sweden. I’m in Norway at the moment and I can tell you that you won’t find anything this delicious anywhere. Restaurant food is AMAZINGLY expensive to an American. I’m leaving for Sweden on Tuesday and hope to encounter Smorgastorta somewhere along the road. Lots of pretty colors, looks high calorie, though….oh well, my experience with Swedish food is fairly limited so I have no idea what’s good (lots of things when well-prepared, I imagine). I tackled a Smorgastarta for Easter a few years back. It was incredibly fun to construct and watch people try to wrap their minds around a sandwich cake. I have to say, they can be very beautiful and tasty. I think it helps if you live for sandwiches, seafood and tradition! Jessica, yes I realize the pink is from beets, it just looks really nauseating with the meatballs…. I think all the food in the photographs look delicious and hoped you would throw in the recipes! My tummy is rumbling. I am traveling and unable to provide recipes but if you do a search online there are lots of recipes for Swedish sandwich cake – good luck! It’s like a great big square sandwich with everything on, and if it’s good it’s really good. It’s important to get the balance right, though. ……..you need a guide!!!! Tell me next time you are in Sweden!! #frustrated!!! I was with a Swedish friend most of the time that writes books on Swedish food and specializes in wine. However he wasn’t with me that day, but there just aren’t a lot of options for places to eat in remote parts of the country and we’d spent a lot of time planning the trip, and ate at some pretty great places other times. I’ll be writing about them shortly. I’ve seen, and no doubt eaten, worse. C’mon, it doesn’t look THAT bad. Odd, perhaps. Haute cuisine, well, no. You three must not have been very hungry. Hunger makes pretty much everything taste good. Better luck next stop?? I think it’s really pretty. I think I’d have to be very, very hungry to eat it… ew! Very pretty to look at, but not so appetizing. I had a friend in high school who went to Sweden for 1 yr. and came back + 25 lbs. I think it must have been sweets (Swedish pastries) she bragged about that did it! Sandwichcake is great if it’s done well, but… Most of those “cakes” are soggy containing too much of everything (as in DL:s picture) – yuck! All I can say is that I’d have grabbed that platter away from my friend and swapped it for the meatballs in the blink of an eye. Looks dee-lish and I’m of the opinion that too much of a good thing is…even better. I needed to make a birthday cake for a diabetic friend and I made something that was exactly like this. It was a “cake” made of layers of bread and different fillings-guacamole, pate,tuna salad-each item on a different slice so people could mix and match. The “frosting” was cream cheese and the decorations were tiny shrimp, cherry tomatoes, and chopped chives. It was the success of the evening and I even had candles for my friend to blow out. If I’d known I’d been making a “smörgåstårta” I would have spelled out “Happy Birthday” in Swedish! I cannot for my life understand why David would venture into “la Suède profonde” (or as you call it “a remote part of Sweden”) hoping to find something to eat. The meatballs served with that revolting beetroot mayonnaise is a gastronomic scandal let alone I shudder to think about the insides of a roadside smörgåstårta. Quality of roadside food in Sweden is since many years a highly critized item by Swedes themselves. 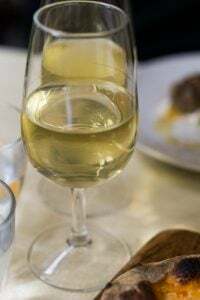 Anyone caring about fine Scandinavian cuisine (it does exist) with high quality at a reasonable price should take the gorgeous ferries from Stockholm (Sweden) across the Baltic Sea to Helsinki (Finland) or that pearl of the Baltic, Tallinn (Estonia). Marvellous food, fine staterooms, a very beautiful archipelago, great entertainment on board apart from shopping and all of this TAXFREE. Regardless of season this trip offers a feast for all senses. Whenever I go to Sweden – a few times every year – I take good care for such a trip (best food on the Viking Line ships) my own favourites at the enormous buffets the very fine pickled (“gravad”) salmon and smoked salmon to be had on your plate as much as you like. There is nothing like it. There is a highly regarded restaurant in that part of Sweden and I met the chef at an event several years ago and was excited to go see his place. It was well-worth the trip, although there aren’t a lot of options for places to eat along the way. But there is no way to get there without driving and passing through a number of small towns, and since it was getting late, we didn’t have a lot of options for lunch, unfortunately. 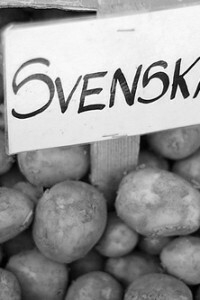 In three journeys to Sweden – a beautifully managed country – I have never found anything to eat! I have never seen so many McDs and other American fast food places. In Europe one looks forward to whatever wonderful things might be found in the next village, but not Sweden. 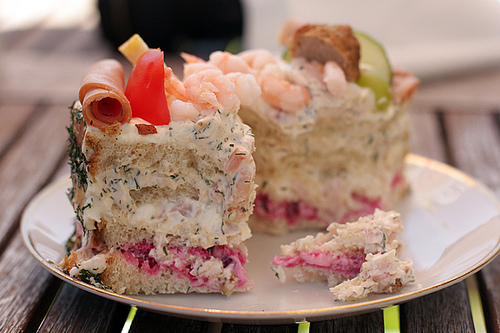 I have tasted many iterations of the sandwich cake both here (Seattle area where there are many Scandinavians) and in Sweden and have always found it almost inedible, if quite imaginative. THe pickled beet mayonnaise is practically a staple, even in private homes. There doesn’t seem to be much of a tradition for eating out, but I have had some wonderful meals in private homes. I have not been as far north as Stockholm, but as far as local food goes, fagedit! I always wondered if you and Alec Lobrano knew each other. Seems like your interests and talents are the same. I read his book Hungry for Paris right after reading your Living the Sweet Life when we first went to Paris to live for our “retirement- present” year. But I don’t remember your mentioning him till now. How do Alec Lobrano and David Lebovitz end up in Sweden? Maybe further blogs will reveal that answer. Sounds like you are having fun! Wow! ‘Seafood cake’! I have never seen anything like it. Interesting! It’s a shame you were so full. It would have been a perfect opportunity to follow up with a bracing slice of hamburger cake for dessert! Have to admit to seeing possibilities for greatness in the sandwich cake. What’s Swedish for schadenfreude? If we disregard the food; the drive (although looong) up to Fäviken must have been beautiful. All the scenery, the long hours of daylight. It must be close to midnight summerish around Östersund this time of the year. It’s just…it looks like…oh, dear God, the inhumanity. So David Lebovitz doesn’t like Smögåstårta. Probably he and millions of other Americans would be grossed out by the boudin at the truck stop in New Iberia, Louisiana too. I had a delicious selection last week of both! I had some great boudin noir a few weeks ago in Paris from Terres d’Avenir. It was terrific, fried up until crisp on both sides. And for dinner that night in Sweden, we had raw beef heart, which I had never had and was quite good. The beet mayo looks awful (so lumpy) however I can imagine that beets and meatballs taste good together. The sandwich cake looks more interesting however combinations must be complimentary to taste good. So, it is the Swedish sandwich version of those garish tiered jello mold salads that were so ubiquitous in the 1950s. I do love the visual excess of it! I like the sandwich cake idea. Like tea sandwiches stacked together– smoked salmon or haddock, watercress, cucumber, with a good bread like pain de mie- and allowed to sit refrigerated overnight. “Frosted” with herbed cream cheese and decorated with a few shrimp. How terrible could it be? Could coulf of at least incluced a picture ” , , , there was a sunny deck to sit on with – yes – a real Swedish lake off in the distance.”. Your pictures are always great, the subject matter on these were not. You don’t usually start a post with a photo of something truly repulsive. So imagine my relief when you said it was inedible!! 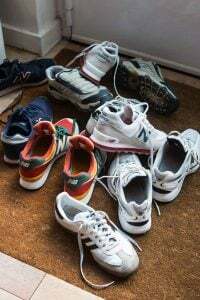 We thought it kind of fanciful – I wouldn’t say it was repulsive; it was just kind of a funny thing, specific to Scandinavia (and other countries nearby.) Since it had store-bought ingredients, it probably wasn’t the best example of a sandwich cake and it’s be fun to do one with great ingredients. It did make me smile, it is sooo Swedish! A smörgåstårta can be really delicious but it is so rich it is not something to be eaten very often, and usually only served when there is something to celebrate and you have a lot of people to cater for. It might be a bit of an acquired taste! For the meatball and beetroot salad sandwich, it tastes so much better if you make both the meatballs and the beetroot salad yourself. I am reading this first thing in the morning and I feel queasy just looking at the picture, just as I do when I go to the deli here in the U.S. and see head cheese. That said, I would have been willing to try a bite if you had recommended it, David. Since you didn’t endorse it, however, I will follow my instincts and avoid that unfortunate creation! Wow. Just looking at that made me gag. You are a brave man, David! The food all looks delish…even the beet juice mayo!! Too bad it wasn’t any good. Perhaps when you get home you can create a better swedish savory cake for us to make and indulge in. Oh dear. It all looks quite unfortunate. Sad looking food indeed. Interesting nonetheless and I’ll look up Swedish sandwich cakes out of curiosity to see what a good quality version might look like! As with most ather things the result a smörgåstårta ought to be made with fresh and natural ingredients too taste good, The piece in the picture is obviously made of mostly canned and ready-to-use stuff, even the meatballs are bought from a factory in this item.A lot of Swedish bakeries do use prefabricated stuff, cheap fat and such, and you seem to have happened on one of these. Not that I’m fond of even a well-made smörgåstårta. Much to soft and squishy for my taste. And a warning. If you travel in Sweden you usually have to get away from the road for quite some distance to get a decent meal. (And view). Well! It does look pretty good in the photograph. Could you pls tell what the ingredients were? Too much of anything is well, too much. I had a really nice one last autumn. Reindeer meat (and other game meat) and with a distinct flavour of horse radish. It was really good. As with any cake, there are cakes that are really nice, and then there are cakes that are not all that fun. Sandwich cakes done right can be great. The good ones are best ordered from a catering place. I don’t think I’ve seen sandwich cake at a restaurant/cafe for quite some time. They’ve always been especially ordered when I’ve had them. I’ve had an equal toss-up of good ones and pretty bad ones. The bad ones tend to have EVERYTHING and re-asserts the idea of less being more. There are so many ingredients in that sandwich cake that I don’t know how it could possibly taste good. It reminds me of some casseroles, where a myriad of ingredients are blended together, thus the final result is indistinguishable as a food! Years ago when I lived in Canada, I visited a friend and her Mom who was Danish made open faced sandwiches for us. I still remember the pickled red cabbage and the hard boiled eggs in cream sauce. Still one of the best meals I’ve ever had and wish I had the recipes! i think the meatball sandwich looks kinda good. how’d it taste? My Dad is Swedish and first generation American. That meant at family gatherings there was a lot of food made by his older relatives who’d grown up in Sweden, and most of it was pretty horrifying to me–herring, white sausage, and at least once, the legendary lutefisk.But wow, could they bake–the cookies and coffee breads were fantastic. I hope you get to a bakery soon! It took you, David, in the 78th comment to mention the meatball in the sandwich cake! It’s hilarious! And just a half pour toi; it’s like the cherry on top of a sundae. I didn’t know you had so many negatively opinionated blog followers, and ones who are so quick to judge. I just want to say that had your adventurous spirit taken you to a grr-r-eat cafe in a tiny village in Sweden, and you had raved about it, these very same followers would have put that cafe on the culinary map of Sweden! So thank you for eating good meals and bad, and having the kahones to tell us the truth about them. Thank you, David. I’m reading this on a cloudy Monday morning at work. I needed that laugh! That sandwich cake is utterly fascinating to look at, but dear god, that slice just looks ginormous. I can understand how you couldn’t finish it. I mean, how much mayo was in that entire slice??? And I love mayo. Good heavens. 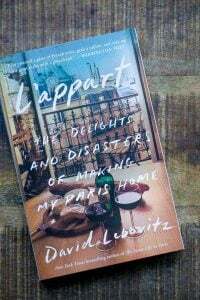 I certainly never expected that David Lebovitz would trump my plans for a smörgåstårta post! Sounds like while I was in Paris battling the air traffic control strike, you were in my neck of the woods. I have to say that does not look like any smörgåstårta I have seen here. 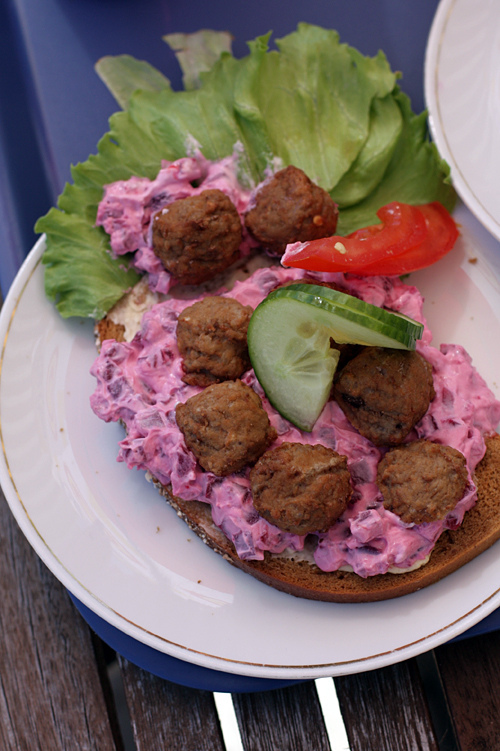 It seems to be a hybrid between a landgång and a smörgåstorta, and open-faced meatball sandwich. So far I have only managed to complete the meatball sandwich with red beet salad post. They can actually be pretty tasty, if you can get past the shock of the pink. And those certainly didn’t look like home made meatballs which does make a difference to the experience. As one previous commenter noted, there are lots of different recipes for smörgåstorta. And if you happen upon one that is heavy on the mayonnaise, well, I can understand the hesitation. An American co-worker of mine was recently commenting on the collective horror of her family (5 children included) when proudly presented with a smörgåstårta at a gathering of their distant Swedish relatives. I think it helps to understand (accept?) the Swedish fascination with sauce. Perhaps you will be spending Midsommar in Sweden? If so, prepare yourself mentally for the herring fest. You will most certainly get your boiled new potatoes with dill, and hopefully some amazing Swedish strawberries. They are typically varieties that are too fragile to ship, so they are picked in the morning when the daylight arrives (i.e. 3:30 am in SOUTHERN Sweden), and then sent to the markets. By the end of the first day, their quality has already deteriorated. If you are fortunate enough to come across some of the best, they will be like eating candy. Thanks for this post which brought a smile to my face, and will prompt me to get on task and write some long overdue posts. Enjoy your time in Sweden! Skål! So funny, I had never heard for sandwich-cake, and I must admit it look over the top. 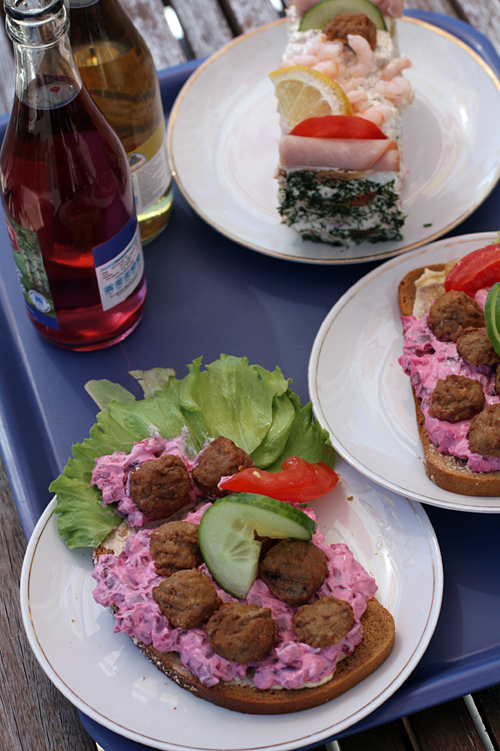 But I have many fabulous smorbrod (buttered-bread or open-faced sandwiches) at Amaan in Copenhagen and in Norway. Oh, the fresh shrimp on mayo with a slice of boiled egg and a touch of cucumber! If it wasn’t so much work, I’d make them more often at home. yes! I totally remember this from growing up in Minnesota. They were in the deli cases at the big grocery stores. No high school graduation was complete without one of these as the centerpiece. I had no idea what they were called. Now I know. On first glance it does look like a cake, but upon closer inspection it reminds me of those Dagwood sandwiches we used to make in college after indulging too much and coming back to our apartments starving- then putting everything we found in the fridge on a sandwich. The meatballs and beet mayo looks great though! I love the open-faced sandwiches of Northern Europe, but find this over the top. 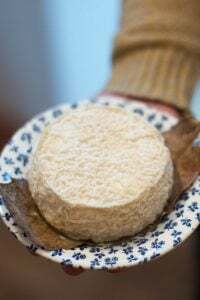 The heaviness comes from living somewhere cold and poor, that is also true of some traditional foods here in Québec, though they won’t seem as strange to David as their origins are either French, British or indigenous American. I couldn’t possibly eat something so heavy. We also have those tiny Nordic shrimp; they are very flavourful and wild-caught. This is food for people who perform hard physical labour in the cold. Lumberjacks here could consume several thousand calories a day and remain lithe (and generally much shorter and smaller than Swedes). I had this at a party once, the host had made a vegetarian version just for me, all I can say is that mayo should never be used as icing.